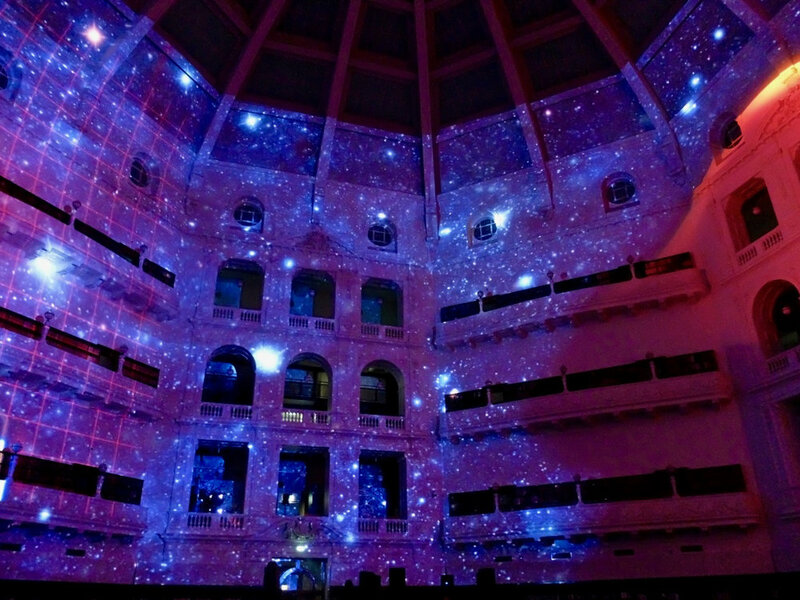 Collaboration with Nick Azidis (PROJECTIONTEKNIK), Adem Jaffers and Bentley Dean. 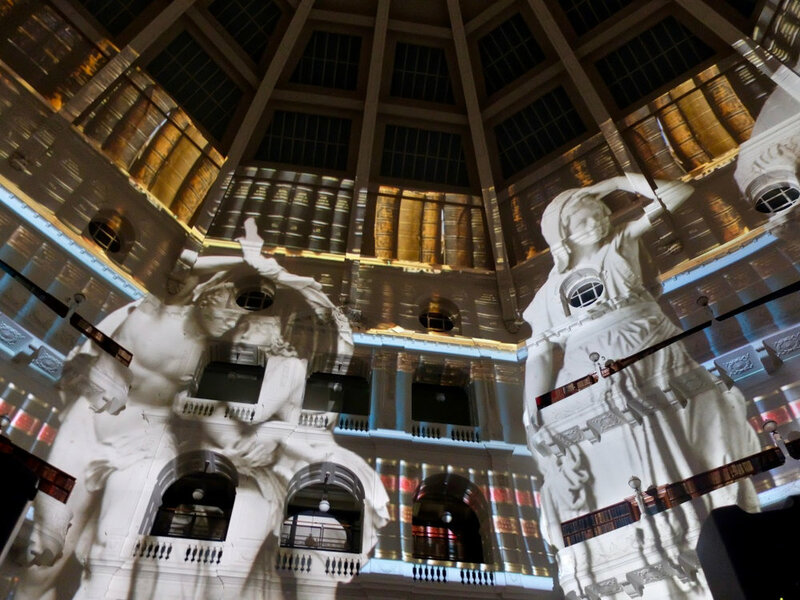 Commissioned by the State Library of Victoria for White Night Melbourne, 20 February 2016. Designed for the La Trobe Reading Room, working with MAV. Multi-channel (quadro + LFE) audio designed to rotate around 4 speaker pairs installed in the balcony, plus 2 speaker pairs and 2 sub-woofers in the central podium. 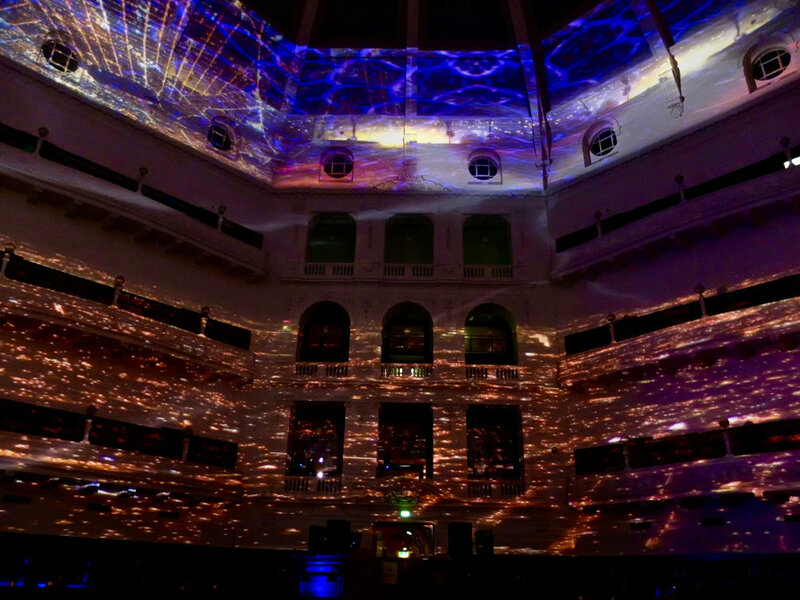 Sounds are spatially located, following the visual movement, with a bed of electronic music composition and drum rhythms mixed through the whole space. 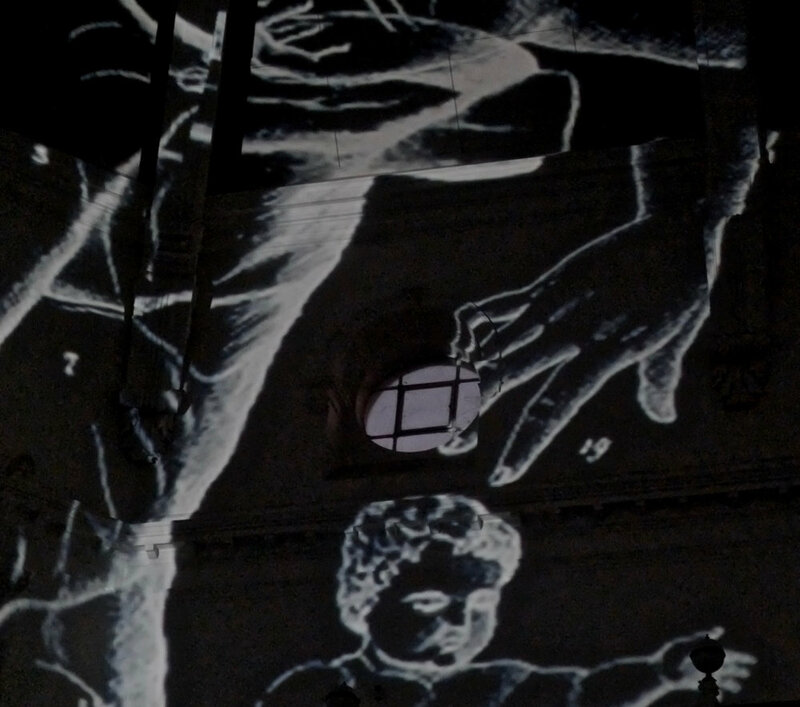 The soundscape works intricately with the visuals to take us on a journey through the inception of an idea. Multilayered sounds include my own recordings and archival / found material. From bellbirds in the Dandenongs, an Athens train line, sung passages from the Qur'an and bible songs from children in India, to recorded voices from the Golden Records launched with the Voyager spacecraft in 1977. The music forming the basis of the soundscape of IDEATION is a section of Beethoven’s ‘Concerto No. 5, in E-flat Major, Op. 73 ("Emperor")’. Listening to my father learning how to play this piece on the piano gave me the conceptual basis for this work. We hear him playing, tentatively, in the opening. Through the work, the melody is teased out, growing ever more complex, until it is realised at the end in a 1938 orchestral recording. 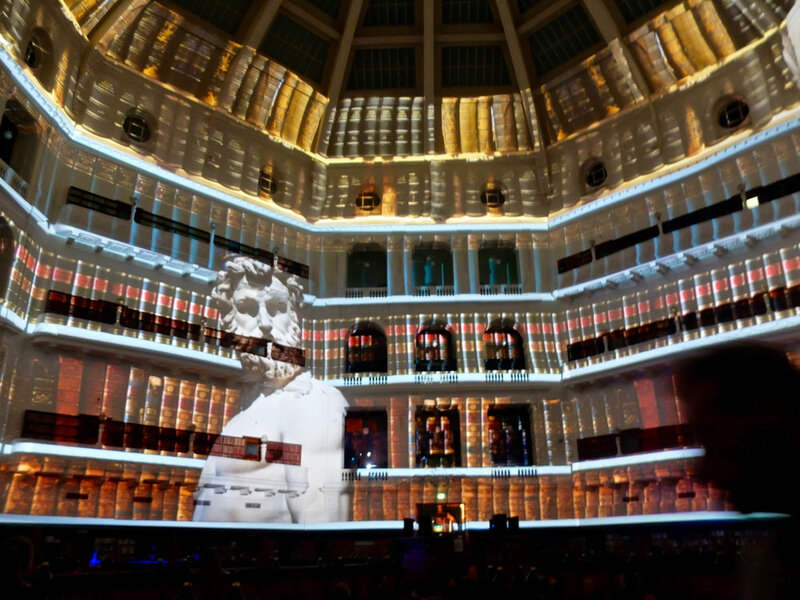 The quotes spoken by the 'spirit of the library' midway through the piece are taken from those engraved into the La Trobe Reading Room walls. The process of building IDEATION in many ways reflects the concept itself. 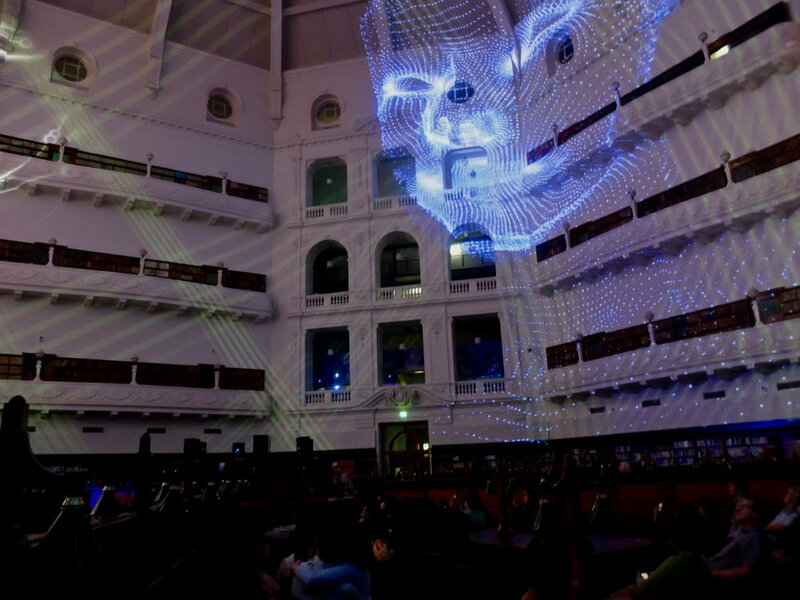 Thinking about responding to the spectacular institution of the State Library of Victoria, in particular its grand Latrobe Reading Room, Nick wanted to do something political, something dangerous, something that would trigger inspiration in audiences to look at the world with a more holistic spirit. He sought out Lisa, Adem and Bentley, as artists who could approach a big, complex idea with open minds. Nick has known Lisa and Adem since the early ‘90s; the association with Bentley is more recent but just as simpatico. On meeting, these four minds collided and the concept grew towards being a positive message of the interconnectedness of all things, with an underlying ecological message that we ignore these connections at our peril. 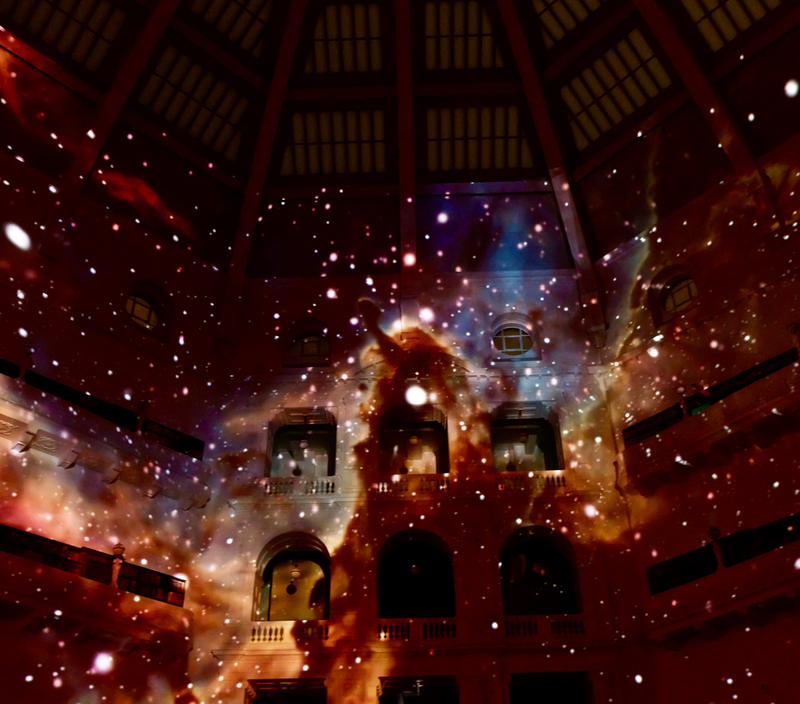 The dome is a terrarium, a container of human experience, constantly growing. Standing on this threshold, we can explore both inside and out. We can travel anywhere, learn anything. It is the ideal place to explore the conception of an idea. Telling the story of the forming of an idea, from inside, is telling the story of connection; the story of everything. From the moment of conception we are learning. Inside the womb, we can hear the world around us. As we are born we are born connected to history, nature and knowledge. If we focused on the things that connect us, rather than the things that divide us, what could we create? All elements in this project have one thing in common: the changing nature of knowledge and patterns of growth that exist everywhere in nature. Fingers of hands. Tendrils and roots of stalks and bulbs. Synapses of brains. Are the patterns the same? Lightning strikes, electricity, rivers, deltas. Musical harmonies, languages, songs. Social groups, solar systems, nodes and connectors. The nervous system, heart, blood, the veins in an eye, branching from the heart. 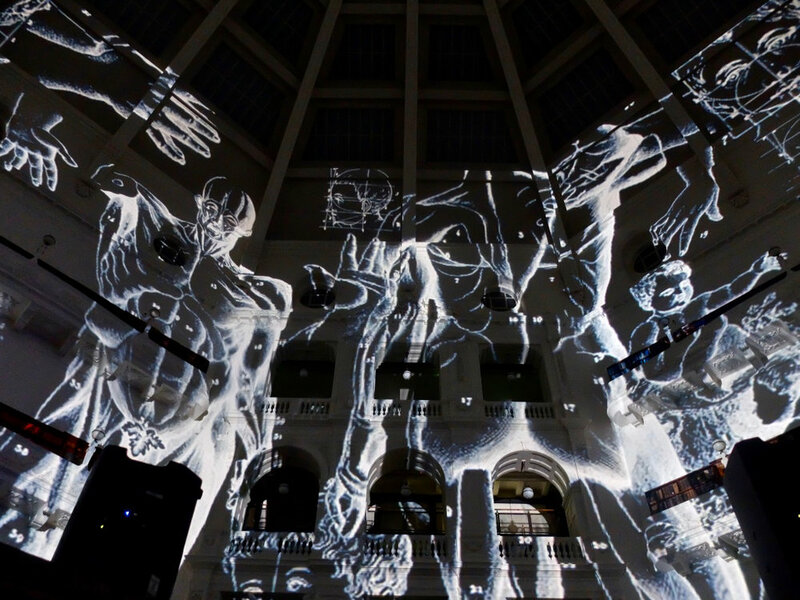 The artists aim to create an experience that has a positive, emotional impact on the audience. We believe that art (and libraries) can inspire change, through a very simple device - by showing someone that, to quote Neil Gaiman, “things can be different.” Knowledge of alternate possibilities is something that art can provide. Art can bring forth a conceptual knowledge, a kind of learning that involves feelings and mental states such as empathy. Through showing, rather than telling; sharing and making connections, we can inspire people to think in a new way, in an inspiring and in a provocative way. IDEATION in this sense is a positive protest, an attempt to change the way people really think about our world and their place in it. IDEATION draws on imagery and sound from many aspects of human existence, from many different cultures and forms of human expression, from the natural and the built world. 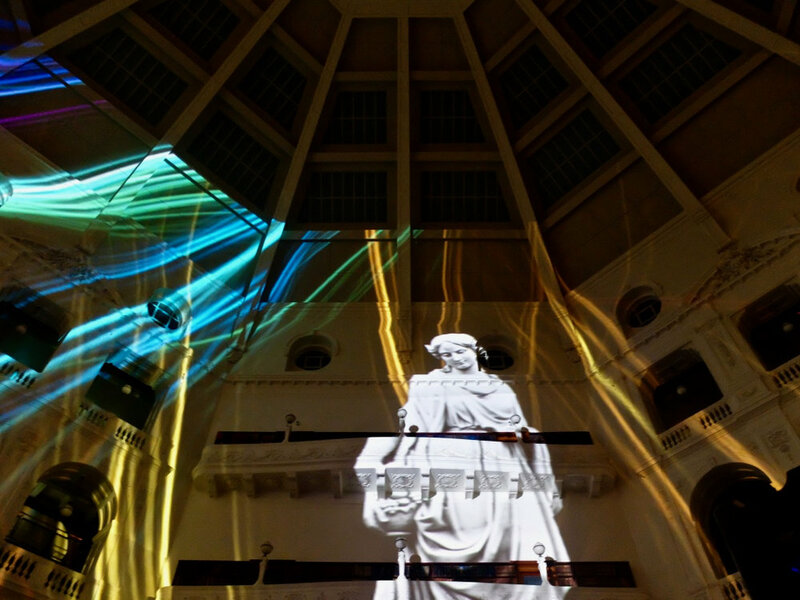 25% of the imagery in this show is drawn from the State Library of Victoria. The journey follows a path from the galaxy in which we live; into the womb; sound waves, neutrons and synapses; birth, the sun, the moon, tree roots, mind and nature; biology; human anatomy, plant anatomy and plant networks; fractal and geometry; mathematics and astrology; writing, speech, language, books, songs, chants and community; art, complex networks, geography, weather, electricity, city networks; nebulas, stars, comets, and us. The soundscape works intricately with the visuals to take us on these journeys, triggering ideas and memories through evocative sounds from bellbirds in the Dandenongs, an Athens train line, sung passages from the Qur'an and bible songs from children in India, to recorded voices from the Golden Records launched with the Voyager spacecraft in 1977. The music forming the basis of the soundscape of IDEATION is a section of Beethoven’s ‘Concerto No. 5, in E-flat Major, Op. 73 ("Emperor")’. Listening to her father learning how to play this piece on the piano gave Lisa the conceptual basis for this work. We hear him playing, tentatively, in the opening. Through the work, the melody is teased out, growing ever more complex, until it is realised at the end in a 1938 orchestral recording. 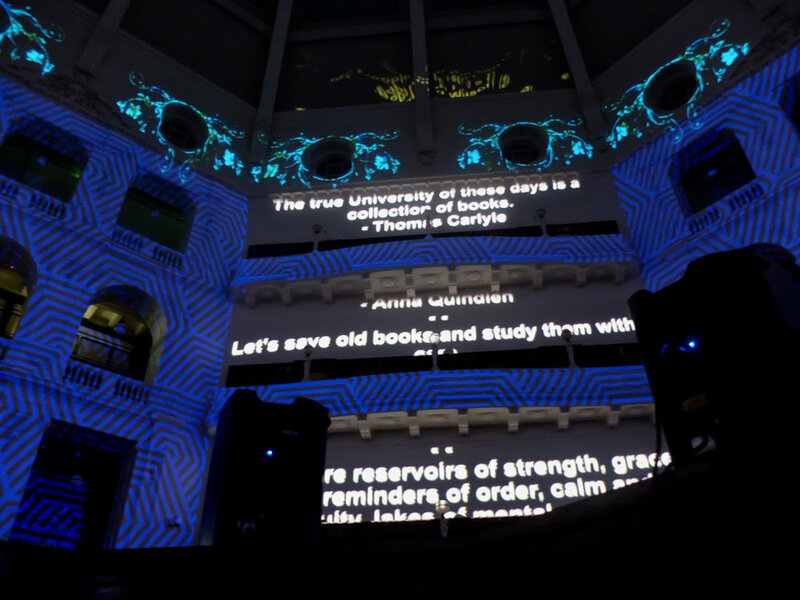 The quotes spoken by the 'spirit of the library' midway through the piece are taken from those engraved into the La Trobe Reading Room walls.